At the 2017 #DTJax River of Dreams Gala, we took the opportunity to present #DTJax Awards to the individuals and organizations who have made a positive impact on Downtown Jacksonville. The Downtown Project of the Year award recognizes a project that has significantly enhanced the economic revitalization of Downtown through the activation of underutilized resources, job creation or leading design practices. Our 2017 winner is an organization that has been a presence in Downtown Jacksonville since 1908, when the YMCA opened on the corner of Laura and Duval streets to serve 12 members. This past August, the Y opened its newest facility in Downtown — one in the works for 25 years: the Winston Family YMCA on Riverside Avenue for its 6,500 members to much acclaim. The Y now has 14 membership facilities, one resident camp, one charter elementary school, 40 school-based child care sites, two facilities for people with development disabilities and two youth development campuses on the First Coast. The new 72,000-square foot location is one of the best YMCA designs in the country and serves as an attraction destination for Downtown while providing important health and social services for Jacksonville residents of all backgrounds. The new family-friendly facility includes an indoor running track, a spiritual wellness center, a kids’ zone and an aquatic center. It also takes advantage of its premier location to offer spectacular views of the St. Johns River and a connection to the Northbank Riverwalk. The new Winston Family YMCA not only promotes a healthy Downtown, but connects diverse populations through community service and its focus on building a kid friendly facility has provided families with a place to go where there is something to do for everyone. The Winston Family YMCA has made the Brooklyn neighborhood a better place to live and visit while providing fundamental services for the Downtown Jacksonville community. By choosing to invest in a new facility Downtown, the Y has given residents and tourists a new reason to visit the Downtown Riverwalk. At the 2017 #DTJax River of Dreams Gala, we took the opportunity to present #DTJax Awards to the individuals and organizations who have made a positive impact on Downtown Jacksonville. The Downtowner of the Year Award honors an individual who has demonstrated inspirational leadership and has made strides to create and support a vibrant Downtown. The 2017 Downtowner of the Year Award was presented to a pioneer of Jacksonville’s vibrant craft beer scene that now includes eight breweries. Ben Davis, owner and brewer at Intuition Ale Works, made his first mark on the Jacksonville business community when he converted San Marco’s The Grotto from a coffee shop into a successful wine bar before opening Intuition Ale Works in Riverside in 2010. For four and a half years, Intuition’s Riverside location was producing and serving great craft beer as a part of their mission to create quality, flavorful and creative beers in a wide range of styles. As the first brewery in Northeast Florida to distribute its beer in cans, they created what is now a statewide trend for craft breweries. A long-time friend of the urban core, Davis made the jump into Downtown last year when he bought the 12,000 square foot Bay Street building that had been empty since 2002. The new state-of-the-art brewing facility can host up to 400 people and features a new 30 barrel brewing system that will produce 25,000 barrels a year, a 17,000 barrel increase. Davis chose to open up the new taproom across from EverBank Field in an effort to be the catalyst for more development in the area. By bringing his well-known brewery to a long-vacant area of Downtown, Davis has established himself as a leader in the Jacksonville business community that is unafraid to take risks in an effort to help revitalize Downtown Jacksonville. Davis’ bold move Downtown has already inspired Manifest Distilling to open in the same building, and has brought local favorite Black Sheep Downtown to serve food at its new location. 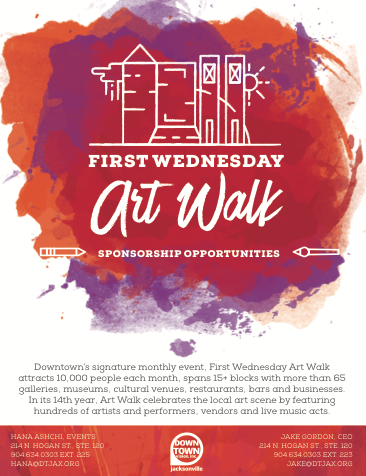 Davis contributes to Downtown not only in his efforts to revitalize the area, but in his partnerships with organizations such as the Arc Jacksonville, Community Connections of Jacksonville and AIGA Jacksonville. At the 2017 #DTJax River of Dreams Gala, we took the opportunity to present #DTJax Awards to the individuals and organizations who have made a positive impact on Downtown Jacksonville. The Downtown Achievement Award recognizes an individual or organization for a significant body of work that reinforces Downtown as the premier center for arts, dining, retail, entertainment, business and/or urban living in Northeast Florida. The 2017 Downtown Achievement Award was presented to Council President Lori Boyer for her persistent work to improve Downtown — especially the Southbank — as a member of Jacksonville’s City Council. As a member of City Council, she has served on every standing committee and spent two years as the chair of the Land Use and Zoning Committee. In 2013, Councilwoman Boyer received the Charles Webb Award for Outstanding Service to the Council, and recently chaired the Special Committee on the Capital Improvement Program which has conducted an in depth review of capital accounts and borrowing practices. After an impressive career as a lawyer and then President of real estate and management companies, Boyer was elected to City Council in 2011 and re-elected in 2015, when the District was expanded to include Downtown’s Southbank. After being active in the San Marco Preservation Society since 1987, she has expanded her focus through her work in City Council to growing Downtown’s Southbank into a livable urban neighborhood. Council President Boyer also champions Jacksonville’s river and tributaries, recently creating the Waterway/Waterfront Activation Initiative to bring together City departments, businesses and nonprofit organizations to make the endless possibilities the St. Johns River offers a reality. Her devotion and commitment to capitalize on the unique natural resources our city offers are an integral part of making Downtown Jacksonville the vibrant cultural center that it has the potential to be. Learn more about the Waterway/Waterfront Activation Initiative here.